You need a model that will make them say "WOW!" Wouldn’t you love to show more than a rendering at your next design review? Do you think your client would react differently if they could FEEL the weight of your concept? Or watch the mechanism move, slowly and precisely, when they press the release button? We understand that the type of model you need often depends on where you are in your design cycle. Making your model communicate effectively means balancing appearance, functionality, and budget. Typically made early in the design cycle, but certainly not limited to it, research models can target a wide variety of factors in your design. Your research model can help you investigate how users react to the shape or color of your concept, if the features are in the right place and make sense, if the weight feels right in your hand, and if that mechanism really is too difficult to operate. Whether your research is behavioral, emotional, ergonomic, or mechanical, we can communicate your intent with a budget-conscious solution. Often the most frequently made models throughout the design cycle, these models help you define your form and refine your details. Incorporating sophisticated mechanisms, interchangeable parts, and special effects, Designcraft can create the perfect model for your aesthetic evaluation or functional validation. Once you’ve figured out the geometry of every detail, finalized your color choices, and committed to your surface textures, it’s time to pull out all the stops. The opportunity to evaluate the physical characteristics of your product is invaluable in product development. Production-like finishes, sophisticated mechanisms, specific textures, interchangeable parts, and many other special effects create models with (better than) production-quality realism. Often produced as sales tools to be used for marketing and trade shows, your presentation model can help clearly communicate design intent to manufacturing, or be used for presentations at design reviews. You Need it to Match Your Target. Sometimes, You Need to Create the Target. Colors elicit emotions and define your brand identity. They make your product stand out and communicate its purpose. We can help you create an entire color palette for your product line or match an existing one. Our color experts have a proven reputation through countless experiences assisting the most discerning of clients, often achieving colors which have no precedent. 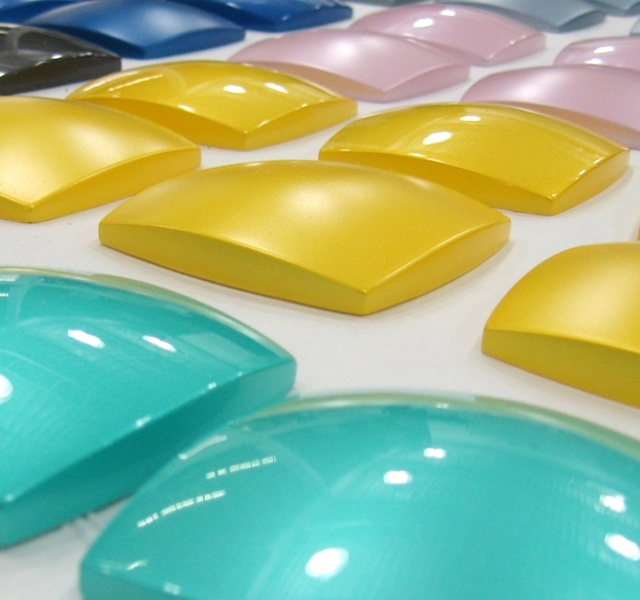 Designcraft develops custom colors for the paints we apply to your product, and for the cast urethanes and silicones that we use in our prototype tooling. We match to industry standard color books, existing products, supplied samples, or the idea in your head. Provide us with a starting point and we’ll use our library of Chromatic Pigments, Metallics, Pearls, Candies, and Fluorescents to achieve the color you’re looking for. Your product’s graphics are as much a part of your brand as they are part of the user experience, and their execution has a dramatic impact on the quality of your product. 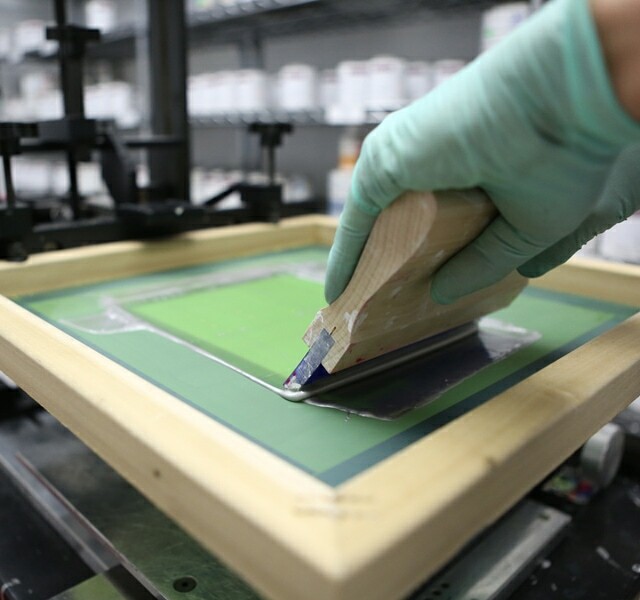 From full color flatbed UV printing to silk screening, vinyl wraps, and dry transfer graphics, Designcraft has many ways to deliver production quality graphics in the colors of your choice. 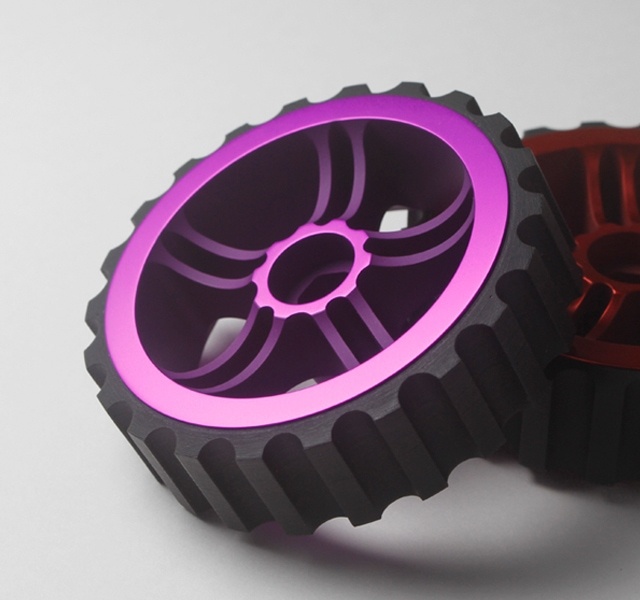 A service offered by few others at the prototype level, Designcraft can develop custom colors and apply them to your aluminum prototypes, with no minimum order or long lead times. Anodized surfaces are attractive and durable, meaning no more chipped or pooling paint. Request different finishes including brushing, polishing or texturing before the anodizing process is applied and watch as it uniquely preserves the underlying metallic finish. When that extra WOW factor is needed; lighting effects, movement, magnetically interchangeable parts, and exotic materials may be added to a model. We can bring the world of colors, materials, and finishes together to help your model create unique interactions with your audience. If you can dream it… we’ll find a way to make it. We’d love to help you make your audience say “WOW!” with your next model.